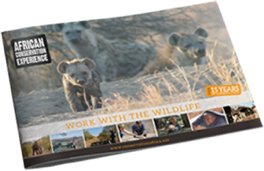 Please read these conditions carefully as they set out the rights and obligations between you and us, African Conservation Experience. African Conservation Experience is a trading name of African Conservation Experience Limited, a company registered in England under number 3794924 with registered office at 5 The Orchard, Holcombe, Dawlish, Devon, EX7 0JD. Upon acceptance of your booking these provisions will form part of your contract with us. Once we know that the trip that you require is available we will provide you with a Booking Form that you must return to us signed within seven days. Once we have received this and checked that the details are correct, we will issue you with a Booking Confirmation which includes a booking reference number: at that point of issue of the booking reference number by us the contract between you and us comes into existence. Please check the Booking Confirmation carefully on receipt to ensure it reflects your understanding of the project which you have booked. Any discrepancies must be notified to us immediately. You are advised to take a copy of the Booking Confirmation with you on your trip. A non-refundable deposit of £295GB / $500USD / $500AUD / $600CAD / €350. Balance: The balance of the price is due 12 weeks before departure. For any bookings made within 12 weeks of departure payment is immediately due in full. Late payment: Please note that if you do not pay on time we reserve the right to cancel your booking and recover from you any prices or charges incurred by us as a result of such deemed cancellation, including flight cancellation charges and our administrative prices (see paragraph 4 for details). Payment can be made to African Conservation Experience Limited; online payment or over the phone using credit or debit card, or by bank transfer. Prior to departure and potentially at very short notice we reserve the right in our absolute discretion to vary the programme – including for example, dates, airport and reserve destination – in order to react to events that have occurred since Booking Confirmation that are outside our reasonable control. If so, we will take reasonable steps to notify you of such change or provide you with alternative dates and you will be deemed to accept the variation upon receipt of such notice. You will not be entitled to payment of compensation where the change or variation was caused by unusual and unforeseeable events over which we have no control and which we could not have avoided even if we had taken all reasonable care. Such unusual and unforeseeable events may include without limitation: game reserve supply difficulties, war, riots, civil unrest, industrial disputes, terrorist activities, natural and nuclear disasters, fire and adverse weather conditions. Notice : If you wish to cancel your booking this must be done in writing by email or letter to our UK office. We can only accept a cancellation from the person who made the booking. Cancellation charges and discretionary scale: If you do cancel, or if you are deemed to have cancelled under paragraph 2, you will not be entitled to the return of your non-refundable deposit, and we reserve the right to recover from you any prices or charges incurred by us as a result of such cancellation, including flight cancellation charges and our administrative prices. In the interests of clarity, we reserve the right to apply the following fixed sliding scale of cancellation charges: if the cancellation is valid more than 12 weeks prior to departure we will refund all payments made by you, less the deposit. In the final 12 weeks prior to departure date we will refund as follows: from 12 weeks to more than 8 weeks prior – 75% of aggregate price less deposit; 8 weeks to more than 6 weeks – 50% less deposit; 6 weeks to more than 4 weeks – 25% less deposit; and 4 weeks or less – no refund. If the cancellation charge is greater than the amount you have paid to us prior to cancellation, the balance becomes a debt owed by you to us. Insurance claims: You may be able to recover your losses resulting from cancellation if you cancel for a reason covered by your insurance policy. We offer a discretionary deferral policy in some cases, whereby you may transfer your placement to a later date, within a year of the original departure date of the original placement. This is at ACE’s discretion. Please contact us by email or post if you wish to defer your placement. A £100/$125USD additional deferral deposit is required at time of deferral, which is deducted from the final payment balance. Placement prices are confirmed at time of booking, thus it is at ACE’s discretion whether your placement cost will be increased to be inline with current prices if you defer. By placing your booking with us you acknowledge that you will be participating in what at times may be a hazardous activity in a location where operating conditions are very different to those you may encounter in your home country. Whilst we make every reasonable effort to ensure that the reserves and operators operate in a prudent and safe manner you must at all times use your discretion to decide whether your personal safety is in danger and take steps accordingly. You may also be asked to read and agree to a consent document to participate in the full range of activities at the local reserve. If you have any concerns before you place your booking please discuss these with us. 4 – events which neither we nor our suppliers could have foreseen or forestalled even if we had taken more reasonable care. In any event our liability will not exceed the lower of (a) any limitation applicable under any international convention (including the Montreal Convention on international flights, the Athens Convention on international carriage by sea, and the Paris Convention on hotels and other accommodation ) governing or relating to a breach of the service complained of, and (b) the price of the trip (excluding flights) of the person making the claim against us. Nothing in this paragraph excludes liability for personal injury, illness or death caused as a result of our negligence. Your statutory rights as a consumer also remain unaffected by the above limitation. It is an express condition of your booking that you must have valid insurance cover for the duration of your trip and that it is adequate for your needs and the type of activities you will be undertaking as part of your holiday. The cover must also include a twenty-four hour emergency treatment (including airlift) and repatriation service. You will indemnify us for any breach of this provision or losses we suffer as a result of you being under- or uninsured. We advise you to study the terms of your chosen policy very carefully to ensure that it is suitable and adequate for you and the purpose as we cannot check individual insurance policies. The onus is on you to check this taking into account the higher risks associated with your placement on a project in a remote location in Africa. We will require the insuring company name and policy number before sending out your departure pack. If you have a complaint during your placement you should tell the representative at the project who will do his or her utmost to put the problem right as soon as possible. If you fail to follow this procedure we cannot accept responsibility as we may have lost the opportunity to investigate and rectify the problem. If your complaint cannot be resolved completely locally you must write to our office at Unit 1, Manor Farm, Churchend lane, Charfield, Wotton-Under-Edge, Gloucestershire. GL12 8LJ within twenty-eight days of completion of the placement with full details, and we will try and resolve the matter amicably. If you fail to notify us within twenty-eight days of the end of your trip we reserve the right to reject any claim; it is an express condition of your agreement that this procedure be followed. Your Financial Protection When you buy an ATOL protected flight or flight inclusive holiday from us you will receive an ATOL Certificate. This lists what is financially protected, where you can get information on what this means for you and who to contact if things go wrong. We, or the suppliers identified on your ATOL Certificate, will provide you with the services listed on the ATOL Certificate (or a suitable alternative). In some cases, where neither we nor the supplier are able to do so for reasons of insolvency, an alternative ATOL holder may provide you with the services you have bought or a suitable alternative (at no extra cost to you). You agree to accept that in those circumstances the alternative ATOL holder will perform those obligations and you agree to pay any money outstanding to be paid by you under your contract to that alternative ATOL holder. However, you also agree that in some cases it will not be possible to appoint an alternative ATOL holder, in which case you will be entitled to make a claim under the ATOL scheme (or your credit card issuer where applicable).If we, or the suppliers identified on your ATOL certificate, are unable to provide the services listed (or a suitable alternative, through an alternative ATOL holder or otherwise) for reasons of insolvency, the Trustees of the Air Travel Trust may make a payment to (or confer a benefit on) you under the ATOL scheme. You agree that in return for such a payment or benefit you assign absolutely to those Trustees any claims which you have or may have arising out of or relating to the non-provision of the services, including any claim against us, the travel agent (or your credit card issuer where applicable). You also agree that any such claims may be re-assigned to another body, if that other body has paid sums you have claimed under the ATOL scheme. information is provided by us with no liability for error. It is your responsibility to ensure that you have travel documentation to suit your personal circumstances at all times and that you do not breach the terms of your visitor permit or otherwise while in Africa. We accept no liability for any entry difficulties that you may encounter. Travellers to South Africa under the age of 18 do have to supply certified supporting documentation to immigration when travelling – please see https://www.gov.uk/foreign-travel-advice/south-africa/entry-requirements for further information. You will be participating in strenuous activities in climatic conditions that you may not previously have encountered. We recommend that you are physically fit and, if in doubt, check with your doctor prior to placing your booking. Up to date medical advice should be sought regarding malaria, AIDS, TB and other potentially relevant medical issues associated with African wilderness and travel. While we are happy to discuss our experiences with you we cannot offer medical advice. A condition of your booking is that you are required to make a positive contribution to the reserve and to behave at the reserve and on the journey to and from it in a proper manner and in particular to observe strictly any rules and regulations of the reserve. Failure to do so may result in your trip being cancelled in our absolute discretion and arrangements made for your return to the United Kingdom; any prices or expenses incurred in so doing will be a debt due from you to us. A code of conduct is provided for guidance only, and we reserve the right to amend this at any time. In particular, violent conduct, drug or alcohol abuse will not be tolerated. We are registered under the Data Protection Act 1998 and handle all your personal data accordingly. If you have provided us with the appropriate consent on the booking form we may from time to time make your name and contact details available to selected organisations for marketing purposes and/or to other volunteers or potential volunteers. Should you change your mind at any time please contact us. We reserve the right to assign, transfer or sub-contract all or part of your booking to a third party. Your booking is personal and non-transferable without our written consent. We reserve to amend these terms and conditions from time to time by giving you reasonable notice. Our brochure was believed to be correct at the time or print. Any errors and omissions are excepted. This contract and any dispute between shall be governed by English law and we and you hereby agree to submit any disputes to the exclusive jurisdiction of the English courts.